Actionair, which is part of Swegon Air Management, has updated its widely used Actionpac system and is working directly with consulting engineers and contractors to provide specific fire and smoke control design expertise. In the event of a fire, the dampers should close immediately to prevent the spread of fire and smoke through the ducting or open when needed to enable smoke extraction. The way they are controlled plays a vital role in keeping escape routes open and allowing access for fire-fighters. Actionair’s fifth generation system, the Actionpac LNS5 intelligent addressable life safety damper system, is a flexible and sophisticated package designed specifically for the control of smoke and fire dampers. 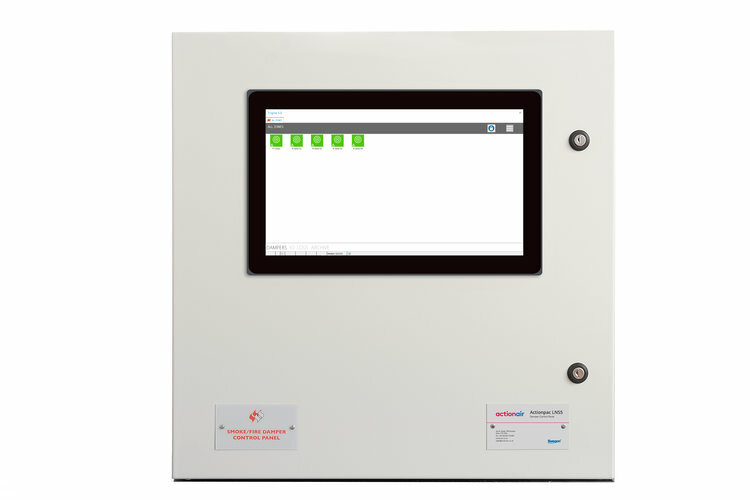 Unlike most fire alarm systems, a dedicated panel is able to monitor damper end switches and does not make the assumption that, simply because power has been removed, the dampers have reached a fail-safe position. The system has been updated to add a number of important new features to its widely used predecessor Actionpac LNS4, which already provided the ability to manage multiple dampers from a single simple interface without the need for additional hardware. Actionair believes this is critical for the safety of buildings and can also provide lifetime cost savings for building owners. LNS5 employs a solid-state embedded computer for reliability and is simple to use and install. It is based around a two-core network cable that communicates with the local interfaces at each damper. This significantly reduces wiring costs compared to more conventional hard-wired solutions. The LNS5 is designed to work on interoperable open protocol platforms and can also be linked to the building management system (BMS) via RS485 or BACnet. This open system approach provides considerable lifecycle benefits to the end client for ongoing operation and maintenance. The control system consists of a 15-inch embedded panel computer, UPS and pre-loaded software, which is extremely user friendly. The server architecture reduces commissioning time, simplifies operation and allows scope for future changes to the building and its HVAC systems. It also provides full diagnostics for system and device integration. In many cases the fire alarm system is used to control dampers, but this strategy does not offer the flexible and sophisticated operation that is built into the Actionpac system. More basic approaches simply shut every damper in the building in the event of a fire whereas the LNS5 offers control of each individual damper. This allows system designers to provide users with a more strategic and targeted approach for fire compartmentalisation, pressurisation and smoke extraction. There is growing awareness across the UK building sector of the need to provide a more flexible and sophisticated approach to fire and smoke control. As a result, more people are looking for expert advice and tailor-made solutions that fit their fire safety strategies. They want a sophisticated approach, but one that is also easy to use – and works quickly and automatically in the event of a fire to support the emergency services. The Grenfell Tower inquiry has clearly exposed the inherent dangers in simply looking for the cheapest solutions. It never makes sense to cut corners when it comes to fire safety and using a purposely designed product for life safety damper control provides peace of mind. However, it can also deliver major cost savings over the lifecycle of the building by cutting maintenance costs and easing access. — Actionair Business Unit Director - Andrew Collard.